This is the season when we start seeing drumstick flowers in the quaint neighborhood markets in Delhi. The high end grocers don't stock such foraged produce but the weekly vegetable markets and the friendly neighborhood subziwala (green grocer) starts bringing it for you if he knows there is a demand. I see that many middle aged and old women keep inquiring the subziwalas about swanjne ke phool or sehjan ke phool (drumstick flowers in local parlance) and buy them quickly if they spot. I feel great at such times that I have a huge drumstick tree in my garden that flowers twice a year. What I do as an instinct that I offer the auntyjees a bunch of drumstick flowers from my garden next time she needs and start chatting. And then I ask how does she cook swanjne ke phool. Believe me I have done it about 4-5 times and everytime I get the same recipe of the curry that has a base of tomatoes and curd and the flowers are boiled and squeezed before being added to the curry. I figured this is the authentic Punjabi recipe of swanjne ke phool ki subzi. I recreated it in my kitchen and tried all the options suggested by different women I met in the weekly vegetable market. I learnt that whenever you add water to the curry it becomes a little bitter in taste as the juices of the drumstick flowers come out in the gravy. If we keep the curry dry and let it cook in it's own juices the taste is better and the bitterness is only in traces. But the best use of these drumstick flowers I learnt from my mother in law. 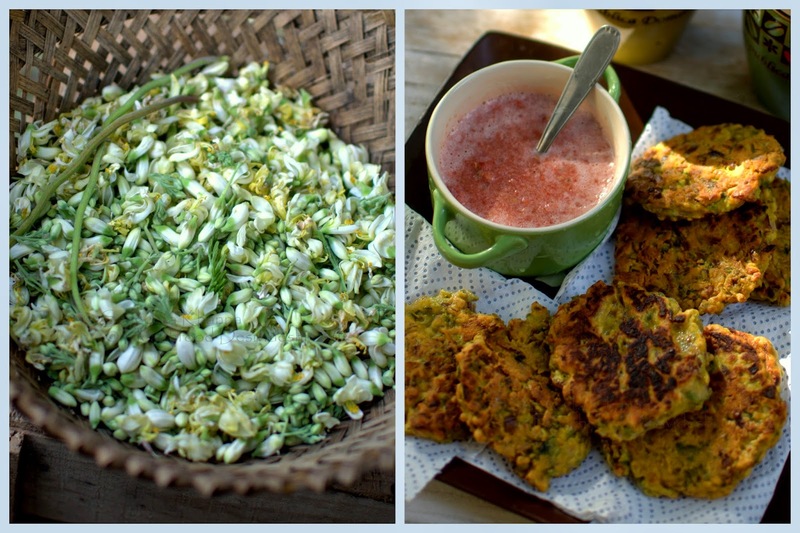 She used to make very nice cheela with chopped onions and drumstick flowers and later I started adding some chopped dhaniya patta (coriander greens) and green chillies etc to the batter mix, started making pakodas too sometimes but the cheela became a common breakfast whenever drumstick flowers were in season. The drumstick tree in my garden flowers twice a year as I mentioned, we get to enjoy this pakoda or cheela quite often. To clean drumstick flowers you just need to pick all the stalks from the buds and flowers and rinse them under running water once. 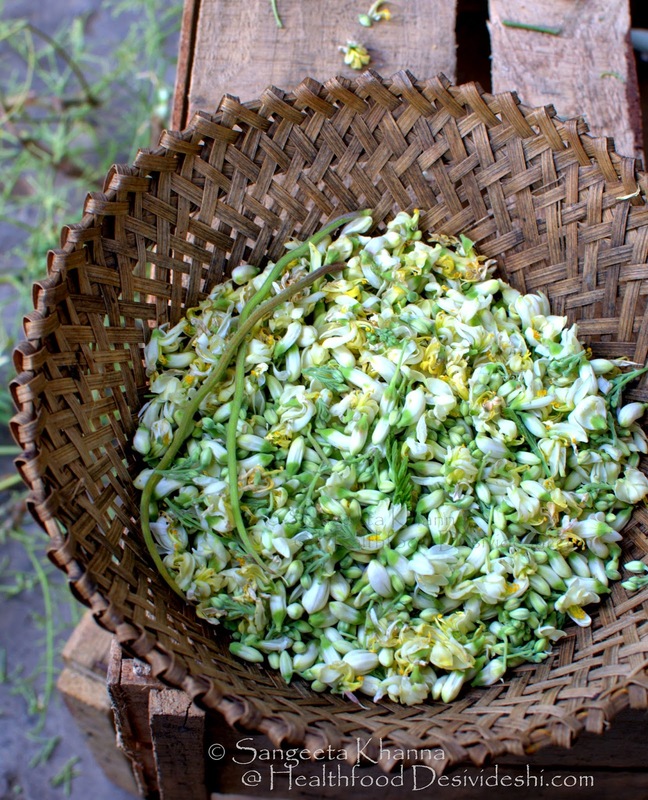 If you have bought from market and have doubts about some dust in it, you would need to dip the flowers in plenty of water in a large bowl, then strain them and rinse again under running water. Let all the water drain before using. Mix everything together to make a thick batter. Heat a flat bottom frying pan and grease with oil. Spread large spoonfuls of batter into several discs on the pan and drizzle oil around them. You can easily make 3-4 small pancakes (cheela or pakoda) at a time on a regular sized pan. If you drizzle the oil a little generously you get the texture of a crisp pakoda and if you keep the amount of oil lesser you get the texture of a pancake. The pancake type would need to be cooked for a little longer to get completely cooked. Serve hot with a green chutney or fresh tomato chutney. The one I served this time was made of 3 large tomatoes, 2 cloves of garlic and 2 green chillies and salt to taste. Just blend everything together and pour into the serving bowl. As kids we used to eat such fritters as a sandwich filling sometimes. I remember buttered slices of bread sandwiching one such fat crisp fritter or patty made of any vegetables and paneer etc or even ghee smeared rotis wrapped around such fritters used to be a filling snack after some long distance cycling or whatever that exhausted us and made us hungry. A similar shallow fried pakoda recipe is here. 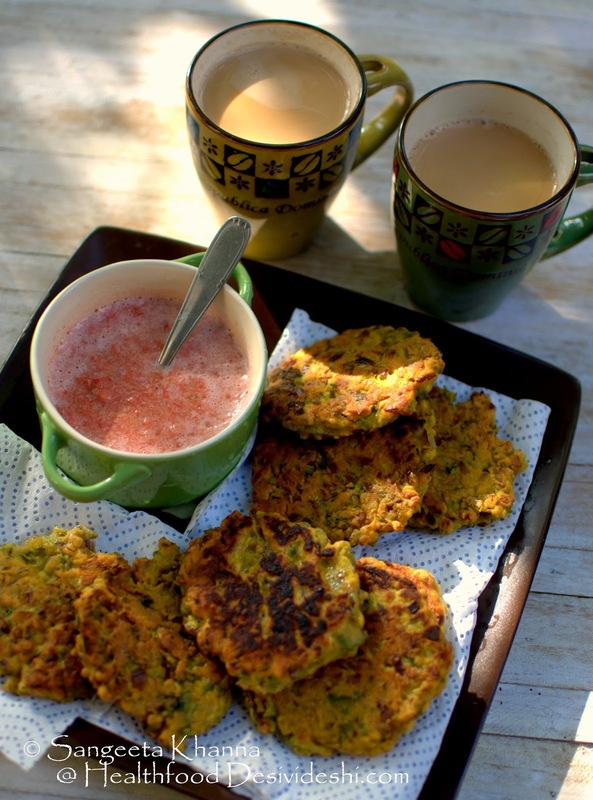 Such shallow fried pakodas and pancakes make really good tea time snacks or hearty winter or rainy day breakfasts. Don't forget to serve a tangy hot freshly made chutney on the side and see how everyone laps up healthy food without a wink. I will share recipes of drumstick flower subzi really soon. Awesome, very different.... out of this world too....... will try if possible..
Good one n very tasty! we make similar dish with rice flour instead of besan. Its actually very tasty and mostly made with rice flour instead of besan. Awesome and unique. Thanks got this recipe.